This morning, THIS article made its way across my Facebook news-feed. It details how up in Northern Canada, dogs are being shot by the Aboriginal or Native peoples (specifically on the Attawapiskat reserve - a recent media target) for "no reason." I found the lack of information given by this article, as well as the clear finger pointing in the direction of the Natives of Attawapiskat and the other near north communities utterly insulting. 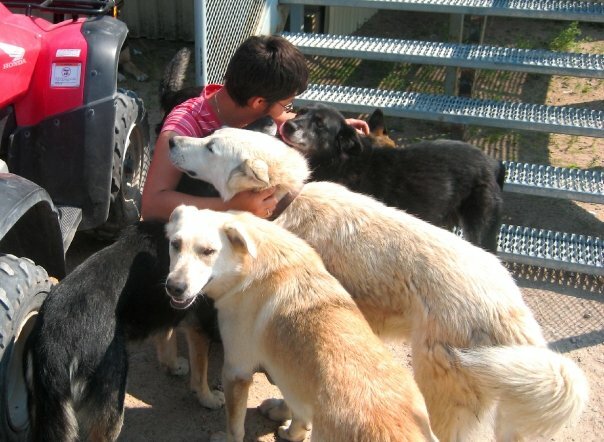 Having lived and taught up north and on a Reserve for two years, and having helped in the rescue of a number of northern dogs, including my own, I understand that what is being done to these dogs seems inhumane and utterly barbaric. But what this story did NOT say is that there are no veterinary services in the north. Finger pointing is all well and good when we live in an area with luxuries such as medical care for our pets - including spay/neuter clinics, but those luxuries do not exist on the Reserves. The people helping the dogs ought to be proud of themselves for helping to get the dogs out, but they should not judge and neither should the rest of the urban world. What many don't realize is that the dogs of the North grow up half wild. They don't know human companionship the way city dogs do. They don’t receive the care our dogs do – there are no pet stores up north, no grooming salons and no animal services. Without "population control" most of these dogs end up forming packs that then claim bits of territory throughout the reserve. This is dangerous for both the dogs and the humans. Some of the more feral packs may go after children – others will go after owed/claimed dogs and kill them. The shootings done by the Natives of the reserves is the most humane way the people of the north know how to control these problems. Most of the dogs born on the reserves will starve or freeze to death before the age of two. They also become prey to the wolves and bears of the area. These shootings are not sport. Warnings are given throughout the community before a shooting happens and all dogs that have been claimed by humans are brought inside or tethered to their dog houses/kennels. More often than not, any dog seen wearing a collar or a bit of cloth around its neck is also left alone. Stating that these dogs were saved from being shot without explaining WHY they were being killed is an incredible injustice to the people of the North. Just as it is beyond unfair to give credit to only one small group of people who do not even venture into the communities, and instead wait for the dogs to be brought to them, when there are others out there who are spending thousands of their own resources to actually go to these communities armed with vaccines and vet technicians to tend to the dogs that survive. It’s hard to understand what life is like on a Reserve without experiencing it – this is something I have learned intimately, but if we want to help the dogs of the North, then we need to lend our support to groups like the Friends of Animush – who not only fly out to all of these communities, but also collect ad bring back any unclaimed dog they can save. It's just easy to write an article that will shock people and make them form their opinion bases on what they read in that article. Happens every day. Sadly. What you did it showed the other side of the story and explained to people, like myself, what is being done and how. That is how the original article should of been presented, so people can get the right picture and understand the situation. Thank you for posting this and for explaining things. It's still horrible that dog shootings are happening in the North, but people need to understand that it's not because these communities are cruel and full or terrible people - it's because they do not have the means, knowledge base, or resources to care for the dogs properly. Rather than wagging our fingers at the Northern Reserves, we should be sending our support to those vets and vet techs who are saving every penny they can to make it up to those communities and offer help wherever possible. I agree with you and I have to say that even you writing about this is what makes this story get a better presentation so for sure you are doing your part in helping out.